Organizations must get the most from their best asset, their employees. Your company collects more human resources (HR) and business data than ever before, yet you may struggle to use it effectively to predict trends in the workforce, minimize risks, and maximize HR returns. You need insight into the causes and effects of relationships between people, corporate performance, and operational effectiveness. 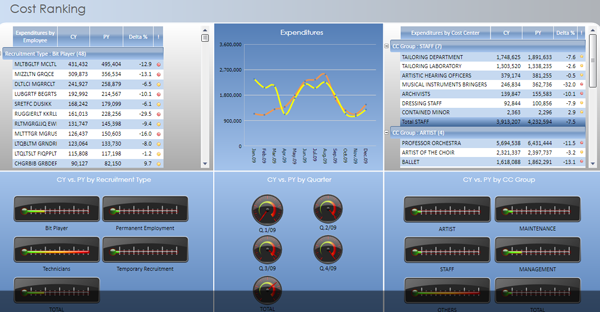 You need tools you can depend on to evaluate and analyze your HR data to deliver real value. You have many options when choosing from available data management systems but most only allow for monthly reporting of historical data; few can provide real-time information. This limits you as an HR executive to operate reactively rather than proactively. You need predictive tools for informing good decisions from the top and throughout the organization at all levels. Our solution provides everything your enterprise needs to deliver better insights into human capital performance and to streamline your HR processes, from recruitment to retirement. We bring together all HR data sources that answer your specific business questions quick and easy. The Neubrain integrated toolkit enables you to link workforce related expense plans to your financial budgeting and forecasting process, all using a single product. 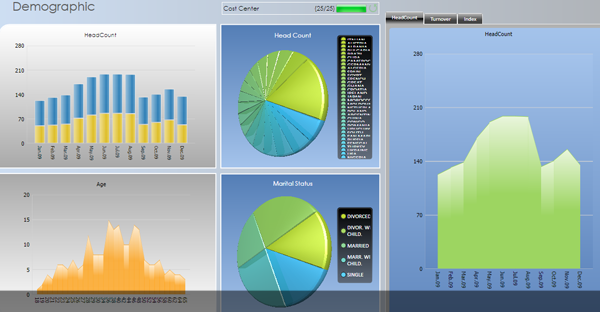 Through dashboards and visualization you may provide real time views of costs, performance, and resources across all areas of the organization. Top level executives can quickly make changes as your business changes. Managers can make quick decisions based on accurate, real-time data, to modify the business processes with the greatest potential for performance improvement.